Sadie Carroway Robertson is a reality television star known for the the A&E show Duck Dynasty. She is the granddaughter of Phil Robertson, founder of Duck Commander. Her parents are Korie Howard Robertson and Willie Robertson, the company's current CEO. She is the younger sister of John Luke Robertson. Robertson was the runner-up on Season 19 of Dancing with the Stars. Robertson is a Christian and had roles in the films God's Not Dead 2 and I'm Not Ashamed. Robertson is the author of the bestseller book about faith and Christian values, Live Original. On August 26, 2013, she started a YouTube channel entitled The New Different with friend and Preachers' Daughters star Kolby Koloff. She has not been seen on the show since January 13, 2014. She sang "Away in a Manger" with Alison Krauss for her family's bestselling album, Duck The Halls: A Robertson Family Christmas. She attended Ouachita Christian School in Monroe, Louisiana. In 2013, she ranked thirty-sixth in the state of Louisiana for javelin throwing. Robertson has her own line of dresses in a collaboration with Sherri Hill, and modeled them during New York Fashion Week. Robertson's line of dresses is labeled Live Original by Sadie Robertson. Louisiana's bearded, camouflage-clad millionaires live out the American dream while staying true to their rugged outdoorsman lifestyle and Southern roots and Sadie gives audiences an up-close and personal, behind-the-scenes look at the family in the exploding A&E show Duck Dynasty. This Louisiana bayou family operates Duck Commander, a booming family business that has made them millions, employs half their neighborhood, but at the end of the day you can find the whole family around matriarch Miss Kay's dinner table. Get ready to experience a special brand of Southern know-how and a down-home sense of humor. "Duck Dynasty" star Sadie Robertson traded in her casual Louisiana garb for a gown Monday night when she walked the runway at New York Fashion Week. Duck Dynasty star Sadie Robertson looked gorgeous as she modeled a prom dress at New York Fashion Week on Sept. 9. 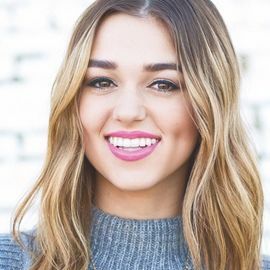 Sadie Robertson was 14-years-old when her family was plunged into the spotlight with their hit A&E reality show Duck Dynasty. Star of A&E's "Duck Dynasty"
Christian Author of "The Shack"